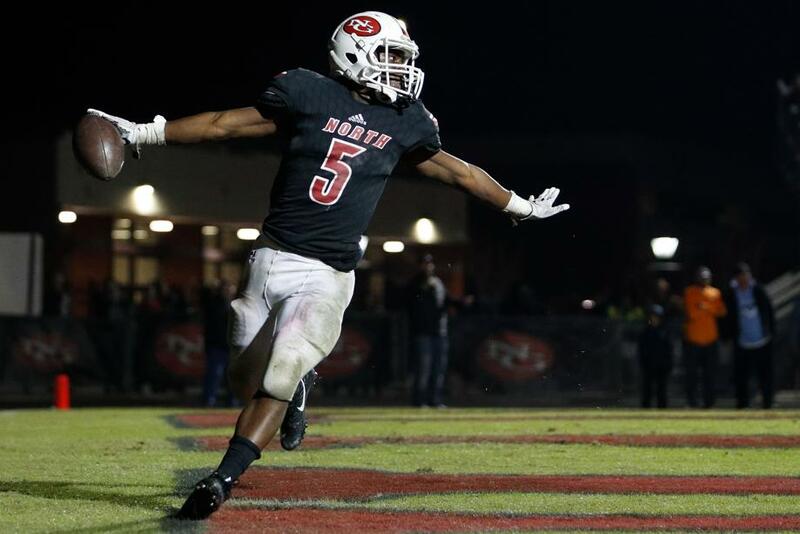 North Gwinnett blew open a one-possession lead heading into the fourth over visiting Norcross, using 21 unanswered points to race to a 42-13 victory. It was Norcross that struck first near the end of the first quarter with a Louis Williams touchdown pass to Christian Sims, but the Bulldogs built a 21-7 lead soon after with two JR Martin passes to Josh Downs for 13 yards and 41 yards — the second of which was set up by Taylor Goodson’s interception — and a long run by Devin Crosby. Norcross gained back momentum in the third quarter after Williams followed a missed field goal by the Bulldogs with a 55-yarder to Sims 4:25 into the quarter and a 50-yard North Gwinnett run was called back for holding, forcing a Bulldog punt. The teams traded interceptions to end the third quarter before a three-touchdown fourth by North Gwinnett, capped off by a 51-yard trip to the endzone by Tyler Goodson. The Brookwood Broncos won a nail biter on the road after trailing host Collins Hill in the fourth quarter. The Eagles ate up almost eight minutes of the first on a 95-yard drive, taking a 7-0 lead on a 5-yard run by DeAngelo Oliver. The Broncos tied it up early in the second with an 8-yard pass from quarterback Conner Chavis to MeKal Fuller, and took a 10-7 lead after a fumble recovery set up a 26-yard field goal by Dylan Schefske with 6:45 left in the half. Collins Hill regained the lead with 9:16 to go in the third on a 20-yard run by Isaiah Love, and the 14-10 score stood until Michael Killebrew got a hold of an Eagles punt and Sterling Ross ran it in to put Brookwood up 17-14 with 9:43 to play. Collins Hill drove deep into Bronco territory in the final minutes of the game but failed to convert on 4th-and-1 at Brookwood’s 15. Chris Carter gave the Broncos back-to-back 1st downs on the ground to seal the 17-14 victory. Lambert junior quarterback Peyton Rich connected with senior running back Drew Dockter for a 42-yard touchdown pass with 5:32 left in the first quarter to give Lambert the only points of the night. With 11:09 left in the second, a scoring opportunity for the Lions was denied by Junior defensive lineman Camden Sagues as he blocked a 37-yard field goal to keep Peachtree Ridge off the board. Dockter may have been done scoring for the night, but his punts of 54, 60 and 45 yards helped keep the Lions offense pinned far down the field. After a weather delay, the Eagles and Falcons kicked off what marked the first meeting between the programs in 17 seasons. After a scoreless first quarter, Pebblebrook’s Jaquavious Jones found the end zone off a 12-yard rush to give the Falcons the lead. Etowah sophomore Brayden O’Neill answered back with a 3-yard rushing score to tie it 7-7. Late in the second quarter, Pebblebrook struck again with a 4-yard rushing touchdown from Ketavious Foreman to take a 14-7 lead at the half. The third quarter was all Etowah, however, as the Eagles outscored Pebblebrook 10-0 with a 23-yard field goal and O’Neill’s second rushing score to take the lead for the first time in the game. Pebblebrook gained five first downs in the fourth quarter, but were unable to put any more points on the board. The South Gwinnett defense scored the Comets only points of the night on a 23-yard interception return in the first quarter. South Forsyth quarterback Drew Morris scored the War Eagles’ first points on a 50-year keeper. The War Eagles went for two and took a 8-7 lead. With under a minute to go in the first quarter, junior Jordan Brunson found pay dirt on a 1-yard run to extend the lead and Morris ran in his second touchdown before the half concluded to put South Forsyth out front 21-7. Harrison soundly defeated the visiting South Cobb Eagles, winning 45-27 at home behind a three-touchdown performance by junior back David Roberts. South Cobb took a 7-0 lead on the first play of the game with a 39-yard interception return, but Hoya quarterback Gavin Hall responded with a 20-yard completion to Mason Babay to tie it up on the next series. The Eagles took their only other lead of the night midway through the first on a 29-yard run by Aeneas Dennis before Harrison put up 24 unanswered points through the rest of the half. Dennis scored again in the third on a 26-yard reception, but back-to-back rushing touchdowns by Roberts gave the Hoyas a 45-20 lead midway through the third quarter. Roswell took a 14-7 lead in the first quarter, thanks to a 2-yard rushing touchdown by Kamonty Jett and a 20-yard rushing touchdown from John Copenhaven with roughly 3 minutes left to go in the frame. West Forsyth completed a 44-yard pass to Casey Cowart with a minute remaining. Each team added touchdowns in the second quarter and Roswell took a 21-14 lead into the second half. Ethan Roberts ran in Roswell’s touchdown and West Forsyth’s Abraham Camara found the endzone on a 45-yard run with 2 minutes remaining in the half. West Forsyth added a 26-yard field goal in the third quarter, but both teams went scoreless in a tense fourth. Colquitt County quarterback Jaycee Harden finished the game 15-of-23 passing for 287 yards and three touchdowns. The Packers took a 17-6 lead at the half and outscored Valdosta 24-7 in the third quarter to push the lead to 41-13 entering the final frame. Harden passed to Marvin McDonald (27-yards), Lemeke Brockington (37-yards) and Ja-Naz Graves (41-yards) for touchdowns. Star backs Ty Leggett and Daijun Edwards, the two-headed beast of a rushing duo, factored heavily in the victory. Leggett finished the game with two touchdowns (76-yards, 19-yards) and 132 yards on nine carries. Edwards rushed for 83 yards and a touchdowns (52-yards) on 10 touches. Colquitt’s stud kicker Ryan Fitzgerald made two field goals (55-yards, 46-yards) on the evening while converting all extra points. Valdosta quarterback Tate Rodemaker passed to Caleb Robinson for a 37-yard touchdown and Rajez Moseley added a 37-yard rushing touchdown. Meadowcreek junior linebacker Joe Jenkins intercepted Discovery quarterback Alex Drazic on the first play of the game and the Mustangs scored just two plays later on a 5-yard run from senior Javion Johnson. Discovery answered with a quick touchdown, but a 70-yard quarterback keeper by Quincy Bonner put visiting Meadowcreek back in front 14-7. Discovery managed to take a 17-14 lead early in the second quarter, but the Titans were unable to contain the Meadowcreek backfield. Johnson went on to score three more touchdowns, including a bruising 75-yard score in the third quarter and teammate Omie Huntley scurried into the endzone off an 8-yard run shortly after. Kennesaw Mountain’s star running (and ASU commit) Keyon Brooks had three touchdowns on the evening. Two of them came in the first quarter and the other in the final two minutes of the game to put the Mustangs ahead 37-30. Cherokee stayed within striking distance all night, however, scoring three field goals and a touchdown in the first half, which gave Kennesaw Mountain a narrow 17-16 lead going into halftime. Kennesaw Mountain scored 10 points early in the 3rd quarter to take a 27-16 lead, but then momentum shifted. Cherokee’s two-way star Grant Mogelnicki had three carries for 71 yards and two touchdowns by the end of the third quarter, which gave Cherokee a 30-27 lead heading into the final quarter. Kennesaw Mountains tied the game at 30-30 with a field goal with eight minutes to go in the game and Brooks’ third touchdown put the Mustangs up 37-30 with just under two minutes left. Not to be outdone, Mogelnicki willed his way into the end zone with less than 10 seconds left for his third touchdown of the night and Cherokee gambled and successfully converted its 2-point conversion before celebrating the 38-37 home victory. The Duluth Wildcats came away with a 23-14 victory at home, defeating visiting Lakeside-DeKalb after trailing in the third quarter. Duluth scored midway through the first on a 16-yard touchdown pass from Jaiden Jones to Logan Goins that was set up by a Brennon Julio fumble recovery. Lakeside quarterback Trey Goodman tied the game with 3:36 left in half, connecting with Darius Neason, and a 55-yard run by Peter Mulbah gave the Vikings a 14-7 lead with 4:41 to go in the third. Duluth tied the game on its next possession when Goins broke free on 4th-and-9 for a long rushing score in the final moments of the third, and sophomore cornerback Justin Richardson gave the Wildcats a 21-14 lead to open the fourth with a 35-yard interception return. Duluth’s defense came up big again on the next series, sacking Jones in the endzone after a bad snap for a safety. Lowndes took a 29-0 lead before East Coweta could find an answer offensively. Andrew Koenemann’s diving score gave Lowndes a 7-0 lead and Travis Tisdale added the next score on a 6-yard run. Koenemann’s found Ty Simms for a 17-yard touchdown reception that extended the Vikings lead to 21-0 and Gary Osby found the endzone from 19-yards out to give Lowndes the 29-0 lead following the two-point conversion. East Coweta’s Nate Cronic found receiver Chris Moore on a 24-yard pass for a touchdown but the extra point was blocked. Tisdale reached the end zone again with 6:48 left in the third quarter to give the Vikings a 37-6 lead and Cronic’s run from 10 yards out with 3:12 left in the third quarter tallied the final score. Lee County quarterback Kyle Toole threw five first half touchdowns and Daveon Sanders rushed for a 15-yard score to pace the Trojans to a 42-7 lead at the half. Toole connected with Artavius Warren and Daveon Sanders twice apiece before finding David Goodwin for his fifth passing touchdown late in the second quarter. Americus-Sumter’s Kierston Harvey found Montrellis Willson on an 8-yard touchdown in the first quarter. The only points of the second half were provided by Jammie Robinson’s 40-yard punt return touchdown in the third frame. Mays got its first win of the season, defeating visiting Hughes 26-0 at home in region play. Quarterback Jahquez Evans completed a 68-yard pass to Terrence Morton early in the first, but two turnovers deep in Panther territory left the Raiders unable to add to the 6-0 lead throughout the rest of the half. Morton’s 86-yard kickoff return to open the third gave Mays some second-half momentum, and Evans capitalized with a touchdown pass to Jacquari Wiggles later in the quarter and another to Morton in the fourth to seal the win. The Sequoyah Chiefs won big at home behind a four-touchdown performance by star back Cole Jacobs, defeating region 6-AAAAAA rival Dalton for the first time since 2009. Senior Jordan Bowers set the tone early with a fumble recovery that set up a 10-yard touchdown run by Jackson Smith. Dalton tied it up on the following possession, but turned the ball over again later in the quarter on a fumble recovered by junior Connor Johnston for the Chiefs. Jacobs reclaimed the lead on a 26-yard run, and — after a lightning delay — Smith scored again in the second for a 21-7 score at the half. Dalton answered Jacobs’ 2-yard touchdown in the third with its only other points of the night to trail 28-14 heading into the fourth, but Jacobs’ third and fourth trips to the endzone and another fumble recovery, this time by Spencer Smith, sealed the 42-14 Sequoyah victory. Allatoona outscored River Ridge 10-0 in the first quarter and the Buccanners really ramped up their offensive attack in the second quarter with a 68-yard rushing touchdown from Daniel Parsons to open the quarter with, a 10-yard rush into the endzone by Cameron Cook, and a 41-yard rushing touchdown from Cameron Moore with 2:46 remaining. The Knights were able to put themselves on the board with a field goal at the 4:17 mark of the second quarter and the Buccaneers went into the half leading 31-3. In the third quarter, Allatoona’s Dante Marshall connected with Asante Das for a 43-yard passing touchdown and Daniel Parsons ran the ball 58 yards into the endzone with 7:36 to go. The Buccaneers were up 45-3 to begin the fourth quarter and Allatoona’s Dean Maddox answered River Ridge’s lone touchdown with a 64-yard rushing touchdown with 5:28 left to play. Quinton Brown ignited the Alexander offense with a pair of rushing touchdowns in the opening quarter to give the Cougars and early 14-0 lead. The Senior back wasn’t done yet, rushing for two more scores in the second quarter. With :03 left in the half, South Paulding got on the board to make it a 28-7 game. Alexander failed to find the end zone again, but two field goals from Jacob Tucker and the lead built by Brown helped keep them ahead of the Spartans for the remainder of the game. In addition to his four scores, Brown finished the night with 23 carries for 163 yards. With Alexander outscoring South Paulding 110-19 over the past two seasons, a 34-21 loss for the Spartans is the best they’ve played against the Cougars in recent years. Tabious Clemmons kicked a 22-yard field goal with 8:30 left in the second quarter to provide the only points of the first half and give visiting Morrow a 3-0 lead. Mundy’s Mill missed a 28-yard field goal attempt with 8:17 left in the third quarter, but an interception by Javion Jackson on Morrow’s next possession set up the Tigers up for a 43-yard touchdown run by Raheem Gaines that gave them a 7-3 lead heading into the final quarter. Demarcus Harris ran in a 2-yard touchdown that increased Mundy’s Mill’s lead to 14-3 with just 3:31 left, but Morrow’s Jimmy Calloway returned the ensuing kickoff 83 yards for a touchdown just 14 seconds later and set up an interesting final three minutes of action. In a tightly fought matchup between the Greyhounds and the Knights that went down to the wire, the Knights were able to come away with the win. It was a slow start for the Greyhounds as they weren’t able to put themselves on the scoreboard in the first quarter. Centennial scored 14 points in the first quarter, thanks to a 25-yard pass from Max Brosmer to Drake Mason, and a 2-yard rush by by Cal Dickie with 5 minutes left to go in the quarter. Pope started to gain a little more momentum in the second quarter, outscoring Centennial 14-7. Within the first minute of the quarter, Pope’s Trevion Hamilton found Zach Owens for a 15-yard touchdown pass. The following touchdown was scored by Centennial’s Richard Shaw after he blocked a punt and took it into the endzone with a 20-yard return. With under a minute left to go in the half, the Greyhounds’ Zach Owens scored off a 5-yard rush. The score was 21-14 at the end of the half in favor of the Knights. Centennial scored the first points of the third quarter with a 4-yard rush from Cal Dickie with 7 minutes remaining. The Greyhounds responded with a touchdown just 2 minutes later as Zach Owens ran 50 yards into the endzone. Going into the fourth the Knights held a 28-21 edge. The Greyhounds put themselves on the board quickly with a fourth touchdown from Zach Owens off a 10-yard rush just 2 minutes into the fourth quarter. With 10 minutes remaining in the game, the score was tied 28-28. With 5 minutes left in the fourth, Centennial scored off of a 60-yard pass from Mark Flemming to Freddy Fairley, making the score 35-28. Rome used big offensive plays and a stingy defense to overwhelm host Kell. Jamious Griffin opened the scoring with a 47-yard touchdown run before tacking on a 49-yard scamper to the endzone in the second quarter, a 14-yard touchdown run shortly after halftime, and a 69-yard TD reception from Knox Kadum with three seconds remaining in the third quarter. Kadum also connected with Xavier Roberts-Donaldson on a 24-yard scoring strike to make it 14-0. The Wolves led 21-0 before the Longhorns scored their only points of the game on a eight-yard pass from Evan Conley to Isaiah Cruz just prior to an hour-long halftime due to lightning. Stockbridge quarterback Jevon McDonald had three rushing touchdowns in the Tigers’ dominant road victory over the Locust Grove Wildcats Friday night. McDonald’s first touchdown came on a fourth down QB keeper early in the game. His counterpart, Wildcats QB RJ McDaniel Jr., answered with a 27-yard touchdown pass to Christian Da Silva shortly afterward to pull the Wildcats within one point 7-6. McDonald ran for another touchdown—this time from nearly 40 yards out—to give the Tigers a 13-6 lead going into halftime. McDonald scored another rushing touchdown to put the Tigers ahead 19-6 midway through the third quarter until R.J. McDaniel ran for a 5-yard touchdown himself to bring the score to 19-12 at the end of the 3rd. Stockbridge’s ground game proved to be too much for Locust Grove to handle, however, as Markell Ramsey added two red zone rushing touchdowns in the fourth quarter to put the game away 33-12. Carrollton got rushing touchdowns from four different players and took a 31-0 lead before Villa Rica’s 41-yard field goal in the third quarter. Quarterback Kashif Taylor was 13-of-15 passing for 164 yards and three touchdowns. Taylor passed to Isaiah Lancaster for two touchdowns and Mile McClendon for one score. Taylor, Keshawn Ridley, Kodee Brewer and Myles Morris each rushed for touchdowns. Connor Smith-McCrum converted a 19-yard field goal in the win. Carrollton managed 477 yards of offense (291 rushing, 186 passing) while holding Villa Rica to just 252 yards (20 passing). First-year coach Cortney Braswell and the Ridgeland Panthers got their first win of the season against host Sandy Creek in a rematch of the 2012 Class-AAAA championship. The Patriots, who won the state title that year by a margin of 45-10 in the only previous meeting between the two teams, struck first on a 21-yard rushing touchdown from Rashad Amos. Ridgeland took an 8-7 lead early in the second when senior back Azavier Blackwell broke free for a 60-yard run and the Panthers converted for two on a swinging gate to Terrence Roberts. Sandy Creek quarterback Jamal Lewis ran for a touchdown (after a near-fumble) to put the Patriots back ahead and Blackwell returned the ensuing kickoff for 98 yards and Ridgeland went into the half up 15-14. The Patriots reclaimed the lead midway through the third quarter on a 3-yard QB keeper by Lewis, but Ridgeland quarterback Tanner Hill scored on a 15-yard keeper of his own to open the fourth. The missed extra point left the score tied at 21-21 until the Panthers defense forced the Patriots to punt out of their own end zone and Sandy Creek’s punter stepped out of bounds for a safety and the 23-21 Ridgeland victory. Cartersville outgained visiting McNair 377-to-8 in first half yardage and built a 56-0 lead. Starting quarterback Tee Webb completed 16-of-25 pass attempts in the first half for 339 yards and five touchdowns to five different receivers (Jackson Lowe, Trendon Horton, Devonte Ross, Marko Dudley and Marquial Coaxum). Running back Marcus Gary picked up 33 yards on five carries and added two rushing touchdowns in the first half action. Cartersville sophomores Evan Slocum and Quante Jennings each rushed for third quarter touchdowns to extend the lead to 70-0. First-year program Demark used clutch goal line stands and well-executed clock management to hold off Class AAAAAAA Forsyth Central and preserve its 7-3 lead for the final three quarters. Host Forsyth Central was first on the board with a 30-yard field goal with 7:31 left in the first quarter. Denmark responded with a 10-play, 79-yard touchdown drive that proved to be the game-winner. Quarterback Ben Whitlock capped the drive with a 3-yard touchdown pass to Adonnis Tolbert. Forsyth Central was stopped on a 4th and goal inside the 5-yard line with 15 seconds left in the half and then drove all the way down to the 1-yard line, only to come up short again on its first possession of the second half. Hard running by Devin Ducille limited Forsyth Central’s chances down the stretch until one last fourth down stop gave Denmark the ball back with 41 seconds left to kneel out the win. Marist dominated in all three phases of the game to take care of host Westminster. The War Eagles scored one touchdown in each of the first three quarters and added a field goal by Brendan Farrell for a 24-0 lead in the fourth before the Wildcats got on the scoreboard with 2:48 remaining on a five-yard touchdown run by Will Hallmark. Lincoln Parker rushed from short yardage for Marist’s first two scores and Connor Cigelske found the endzone on a 17-yard quarterback keeper in the third quarter. Notre Dame commit Kyle Hamilton had five receptions that went for double-digit yards and he also blocked a Westminster field-goal attempt. Joshua Moore picked off two passes for the War Eagles. Troup quarterback Kobe Hudson rushed for an 11-yard touchdown and threw touchdown passes to Ja’Rell Smith (52 yards), Mark-Anthony Dixon (31 yards), Jamari Thrash (31 yards) and Luke Purnell in another Tigers’ blowout victory. Tre Williams and Tyree Carlisle each rushed for touchdowns in the second quarter to build a 39-0 lead and Troup’s Ja’Rell Smith returned the opening kickoff of the second half 80 yards for a touchdown. Mary Persons jumped all over visiting Lovett en route to a 31-point first quarter. The Bulldogs never looked back, maintaining a lead of at least 24 points the entire rest of the game. Quen Wilson led the Mary Persons’ attack, rushing for four touchdowns–including a 75-yarder to begin the scoring early in the first quarter. The Bulldogs also got touchdown runs by Rico Harden and Trentavious Morgan plus a 33-yard scoring strike from J.T. Hartage to Andre Jackson. Blaine McAllister found the endzone twice on the ground for Lovett, cutting the deficit to 17-7 in the first quarter and 38-14 in the second. K.J. Wallace also had a touchdown run for the Lions before Mary Persons scored the final 13 points. Richmond Academy built a 24-0 cushion early in the third quarter and held off host Grovetown to improve to 4-0 for the first time since the 1998 season. Tadarious Davis blocked a Grovetown punt and recovered it for a Musketeers touchdown to put Richmond Academy ahead 7-0 heading into the second quarter. Quarterback Mason Cobb connected with Clydell White for an 18-yard touchdown and Judson Pickett nailed a 32-yard field goal to push the lead to 17-0 at the half. Cobb opened the second half with an 8-yard touchdown pass to Davis to make it 24-0 before Latrell Walker (25 yards) and Jeremiah Williams (5 yards) put Grovetown on the board with rushing scores. The visiting Lions rallied back from a 23-0 deficit and stunned McIntosh in an overtime thriller to celebrate their first victory of the season. McIntosh’s Ryan Cate ran in a 22-yard touchdown in the first quarter and Hayes Herzog increased the lead to 14-0 with a 20-yard touchdown pass to Dane Kinamon. McIntosh opened the second quarter with the first of Kinamon’s three rushing touchdowns in the game, and an Adrien Richez 38-yard field goal pushed the lead to 23-0. Luella’s Dejon Conway got the Lions going with a 58-yard touchdown before the half and opened the second half rally with a 6-yard touchdown run and successful 2-point conversion to cut the deficit to 23-15. Kinamon answered from 44 yards out to push it to 30-15, but Conway found the endzone again from 61 yards on the next Luella possession to cut the deficit to 30-22 with 7:57 left. After a McIntosh fumble, Luella quarterback Jalen Doby found Lamer Overton for a 74-yard touchdown and successful 2-point conversion to tie it 30-30 with 5:49 to play. Kinamon gave McIntosh a 37-30 lead with a 6-yard touchdown run with just 30 seconds left, but that was enough time for Luella to drive down the field and for Conway to score his fourth touchdown of the game on a 5-yard handoff with just .9 seconds left on the clock. Tied 37-37, Luella got the ball first in overtime and took its first and only lead of the game on a 2-yard quarterback sneak by Doby. McIntosh took a costly sack on third down and the Chiefs’ desperation 4th-and-12 attempt from the 17-yard line landed incomplete. After a scoreless first half, visiting North Murray built a 14-0 lead and held off Ringgold in a crucial Region 6-AAA opener. The Mountaineers got on the board with a Date Tidwell 12-yard touchdown run in the third quarter. Ringgold fumbled its next possession and North Murray had an opportunity to extend the lead before the start of the fourth quarter, but fumbled at the goal line and the lead remained 7-0. Quarterback Preston Poag Jr. found Ladd McConkey for a 40-yard touchdown with 10:41 left in the game and Ringgold avoided the shutout with a Cole Kibler 1-yard touchdown run with 1:29 on the clock. Peach County took a 28-7 halftime lead and outclassed AAAAAA Houston County in Fort Valley. Noah Whittington’s 24-yard reception from Jaydon Gibson began the onslaught. Nigel Manns grew the lead with a 5-yard touchdown run and Kapien Everett’s 4-yard rushing score expanded the Trojans lead to 21-0. Gibson connected with Alex Henton on a 25-yard touchdown pass to give Peach County a four-touchdown cushion. Houston County cut into the lead just before half, but the game was out of reach. Everett added another touchdown in the third quarter to give Peach County a 35-14 lead and Manns added a 63-yard touchdown reception from Gibson before returning an interception for the game’s final touchdown. Calhoun’s Zach Fuller converted on an 11-yard run to give the Jackets a 7-0 lead. His 2-yard run with 7:23 left in the first quarter pushed the lead to 14-0. Quarterback Gavin Gray started his night 7-of-7 passing for 101 yards and grew the lead with a pass to Luke Moseley that was tipped by a Sonoraville defensive back into the hands of Moseley for a 53-yard touchdown. Gray connected with Bralin Barton on a 22-yard pass with 3:35 left in the first half to give Calhoun a 28-0 lead. Eduardo Fajardo converted a 26-yard field goal and was a perfect five-for-five on extra points in the victory. Fuller’s touchdown with :58 seconds left in the third quarter pushed the lead to 38-0 and put the game away. Visiting Callaway jumped out to a 22-0 lead in the opening quarter with touchdown runs by Qua Hines and Demetrius Coleman, a successful 2-point conversion and a 25-yard interception return touchdown by Jalin Mekhi Shepard. The Cavaliers grew the lead to 29-0 midway through the second quarter and Jabar Smith rushed for a touchdown on the final play of the half to make it 36-0. Charlie Dixon ran in the only touchdown of the third quarter on its first play from scrimmage, and Antimus Barner iced the game with a 30-yard touchdown run with 8:54 left in the fourth quarter to make it 50-0. Holy Innocents’ trailed 7-6 before reeling off the last 43 points of the game to sprint past visiting Rutland. Michael Cox erupted for four second-quarter touchdown runs, helping the Golden Bears surge into halftime with a 35-7 advantage. Hunter Hawk padded the lead with a 54-yard scoring scamper on the first play of the second half and Xavier Smith found the endzone from three yards out later in the third quarter before a scoreless fourth was abbreviated by a running clock. Matt Davis had a 41-yard touchdown run to put Holy Innocents’ on the scoreboard early and he finished with more than 100 yards on the ground. Prince Avenue Christian quarterback Brock Vandagriff led the host Wolverines to a 63-0 lead at the half with a touchdown run and passing touchdowns to Christian Parrish (48 yards), Evan Treadwell (11 yards) and Mack Simmonds (68 yards). Elijah Hynes ran in a 6-yard touchdown and a Foster White blocked punt set up McMay Melnick for a 1-yard touchdown run in the first quarter. Landon Owens (24 yards) and Tyler Payne (15 yards) ran in second quarter touchdowns. Providence Christian scored the only points of the second half on a 1-yard quarterback sneak with 2:13 left in the game. Bryce Davis opened the scoring with an interception return for a touchdown midway through the first quarter and visiting Whitefield Academy used a dominant defensive performance from start to finish to cruise past Mt. Pisgah Christian. Kaleb Brooks had an interception on the final play of the opening half to preserve a 35-0 advantage and Joel McKinney also picked off a pass for the WolfPack. Jaden Griffith rushed for a pair of a touchdowns, Kyle Holt and Davis Eaton also found the endzone, and Cole Peterson tossed a pair of scoring strikes to lead Whitefield Academy’s offensive charge. The Patriots got on the scoreboard in the third quarter with a 30-yard touchdown pass from Coleman Smith to Grayson Stevens, ending a streak of 42 unanswered points for the WolfPack.